The aneroid capsule assembly has a deep vacuum trapped inside, and measures the difference between the atmosphere outside of the assembly and this nearly perfect vacuum. The internal vacuum is constant and provides the reference pressure that the capsule uses to measure absolute pressure or Psia. 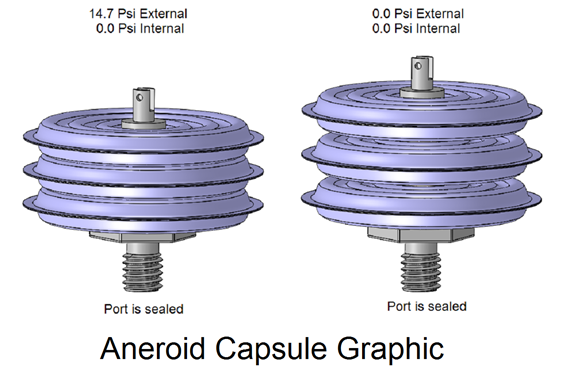 Note the collapsed condition of the absolute capsule compared to the differential capsule. The atmospheric pressure is pressing on the assembly which has an internal vacuum. 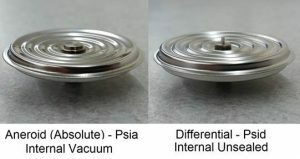 Decreasing absolute pressures up to a near vacuum, the capsule will expand to nearly the same profile as the differential assembly. Both capsules measure a differential pressure and are neutral when the difference is at or near zero. For the aneroid, this occurs when exposed to a vacuum, and for the differential, this occurs when the inside and the outside pressure are equal. 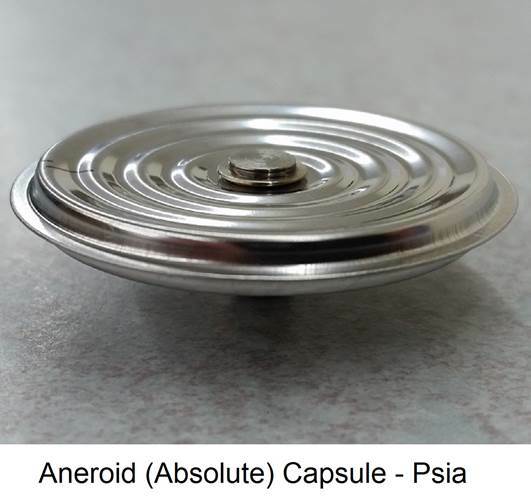 The absolute capsule is used in measurement of sealed systems which are independent of the ambient pressure external to the process. Applications include vacuum pumps, barometric pressure sensors and closed batch process tanks. The differential capsule measures the pressure outside of the assembly with respect to the inside of the assembly. It operates as an analog computer in that any pressure applied equally to both sides of the capsule will result in zero deflection. In application, a small differential pressure can be measured across a filter element in a pump inlet, while the line is at a high pressure. If the line is pressurized at 1,000 Psig, and the filter measurement is up to 10 Psid, the actual measurement is 1,010 high side and 1,000 low side. This is the essence of the differential sensor – Psid measured independent of the line pressure. The line pressure is measured with respect to the outside environment, and is gauge pressure – Psig. A gauge pressure sensor is simply a differential sensor with the low side attached to ambient. In all cases, diaphragm based capsules convert a differential pressure to a displacement. It is important to remember that an aneroid is still a differential pressure measurement, with the special characteristic being that internally this value is held at zero, or full vacuum. Mechanically, the diaphragm functions the same way in sealed and un-sealed assemblies. Note the natural direction of deflection is collapsing with the external air pressing against the internal vacuum. Note the natural direction of deflection is expanding with the internal air pressure exceeding the external air pressure. 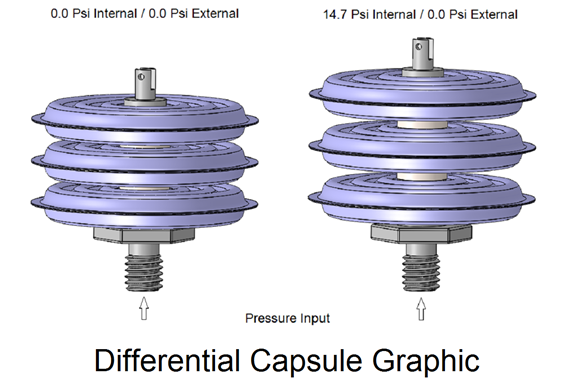 The direction of pressure application can be reversed so that the capsule would collapse on differential pressure. In addition, the higher pressure can be applied both internally and externally for a bi-directional deflection. A clean room zone pressure control can be positive, negative or alternate between both. The capsule will expand and contract accordingly. This is the capsule in the simplest and most compact form. The outer diameter ranges from 0.875 to 2.375 inches with about the same overall height. The higher diameters provide more deflection with respect to applied pressure, and are suitable for very low pressure measurement. Very thing materials are used for draft pressure applications and thick materials can provide capsules for use at 250 psi or more. Multi-stack capsule assemblies amplify the deflection of the basic single cell. The four stack shown can provide the same travel as a two stack assembly, in a taller but lower diameter envelope. 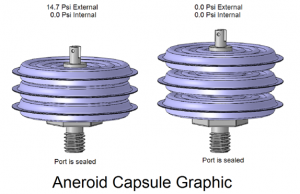 There are trade-offs in selecting a capsule assembly design. The key characteristics are the physical envelope, the deflection rate and the overall full scale deflection. This is the rate expressed in Inches / Psi. This is essentially the calibration of the capsule. Kearflex provides assemblies with a specified rate, and these are consistent within each lot and have known tolerance for lot to lot variation. This is the distance the center travels at the maximum applied pressure. 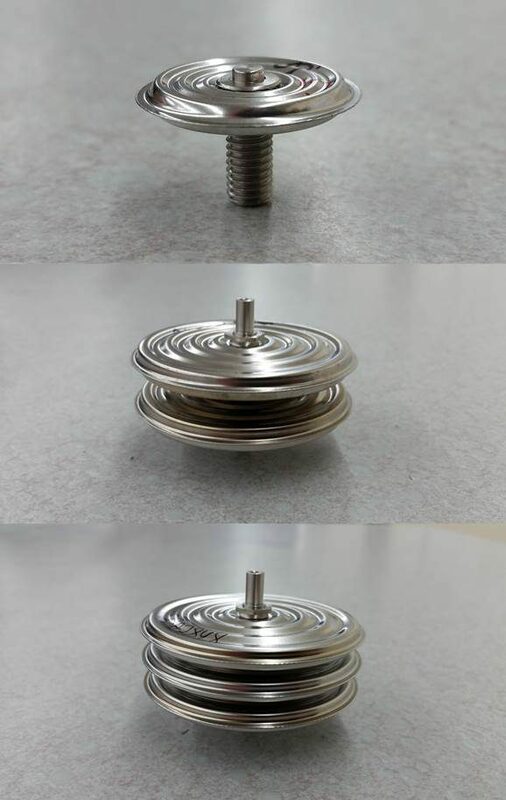 If the assembly needs to drive a servo or a needle movement, the deflection needs to be fairly high – 0.10 inches is common. This can be achieved with a large diameter single cell capsule, or a low diameter quad stack. If the detecting technology is an LVDT coil, then a travel of 0.02 or less is usually acceptable. 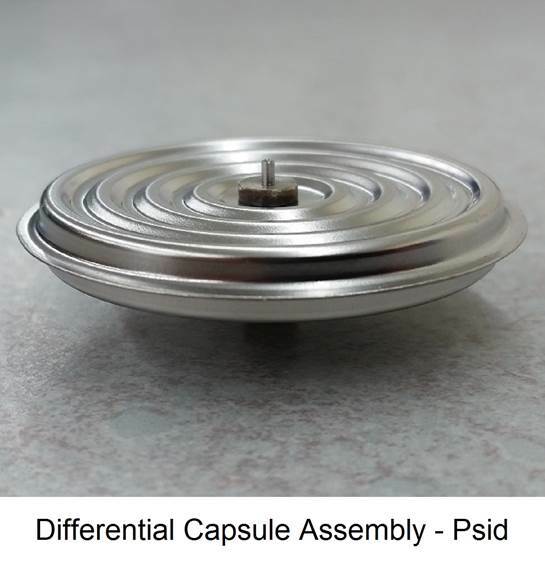 Capsule assemblies can be developed to meet customer requirements, or reverse engineered to provide a form-fit replacement for existing products.